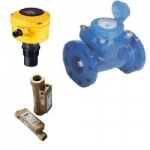 Water Meters, Flow Sensors/Transducers and Storage Tank Level Transmitters. Hydrostatic Water Level Sensor for use with the AquaLogger system, via 4-20mA output. 0-4m Depth with 10m cable. Remote Water Level Logger with GSM Connection for CLoud based Montioring, battery powered. Options for Hydrostatic or Radar Sensors. AquaLogger Compact Remote Water Level Monitoring solution, using either Radar or Hydrostatic sensors. Supplied with Lithium batteries and 12month online data hosting/access. Radar Water Level sensor with 0-8m range and 4-20mA output for use with AquaLogger Remote monitoring solution..
Level Sensors and switches for various types of liquid. Wide range of outputs are available. ATEX, SIL approval on some.